Hepatic toxicity is a significant adverse event that occurs with immune checkpoint inhibitor therapy for cancer, and warrants close monitoring and swift initiation of treatment, according to a study published in the Journal of Gastrointestinal Oncology. 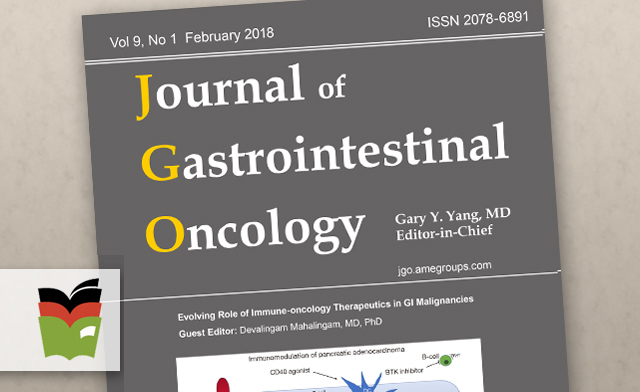 Use of immune checkpoint inhibitors (eg, ipilimumab, nivolumab, pembrolizumab, avelumab) is becoming more prevalent in oncologic care with a growing list of indications including hematologic malignancies; triple-negative breast cancer; and microsatellite unstable colon, gastric, and hepatocellular cancers. In addition to the risk of loss of self-tolerance and development of autoimmune disorders, dermatologic, pulmonary, endocrine, rheumatologic, and gastrointestinal adverse events have been reported with checkpoint inhibitor use. Hepatic toxicity is rare, but is of particular interest among patients with gastrointestinal cancers as delays in the treatment of immune hepatitis may lead to permanent cancer therapy discontinuation. In this review, the authors discuss diagnostic parameters and management modalities for checkpoint inhibitor-induced hepatic toxicity. Abstract: Immune checkpoint inhibitors have promising clinical activity across multiple gastrointestinal cancers and immune-mediated hepatotoxicity is particularly relevant for this group of patients. In this article we will review the recognition, workup and management of suspected checkpoint inhibitor related immune-hepatitis. Submitted Jul 06, 2017. Accepted for publication Aug 14, 2017. Checkpoint inhibitors harness the body’s immune system and enhance the systemic antitumor immune response. The currently approved immune checkpoint inhibitors can be broadly classified into three categories: (I) CTLA-4 inhibitor: currently the only FDA approved drug in this class is Ipilimumab. It was also the first immune checkpoint inhibitor to be approved after improved survival was shown in patients with metastatic melanoma (1); (II) programmed-cell death-1 (PD-1) inhibitors: pembrolizumab was initially approved for patients with metastatic melanoma and has subsequently shown activity in and has received approval for patients with non-small cell lung cancer, Hodgkin’s lymphoma and head & neck cancer. Nivolumab a human Ig4 anti-PD1 monoclonal antibody was also initially approved for treatment in metastatic melanoma and has since gained FDA approval for non-small cell lung cancer, renal cell cancer, head & neck cancer, Hodgkin Lymphoma and urothelial cancer (2), (III) PD ligand 1 (PDL1) inhibitors: atezolizumab is the first drug in this class which received initial FDA approval for metastatic urothelial carcinoma and has since has been approved for metastatic non-small cell lung cancer. Avelumab received approval for Merkel cell carcinoma in March of 2017 and durvalumab received approval for urothelial carcinoma on May 1st 2017 (2). In addition, there is emerging data showing efficacy of immune checkpoint inhibitors in microsatellite unstable colon cancer, gastric cancer, hepatocellular cancer, hematological malignancies and triple negative breast cancer (3-7). Immune checkpoint inhibitors work by blocking the T lymphocyte inhibition and restoring cytotoxic T-cell activity, which acts against greater variety of antigens (8). A downside of employing this strategy is the risk of loss of self-tolerance and subsequent development of a range of autoimmune disorders. The most common adverse events are dermatologic, endocrine, pulmonary, gastrointestinal, and rheumatologic (9). Hepatic toxicity is a rare, but clinically significant, toxicity which is particularly relevant to patients with gastrointestinal cancers. In this paper, we will review the diagnosis and management of checkpoint inhibitor related hepatic toxicity. Patients with gastrointestinal cancers may be at risk for higher rate of hepatotoxicity due to underlying patient risk factors and comorbid conditions. Prior systemic and liver directed cancer treatments can further effect liver function. This makes the recognition of immune-related hepatotoxicity more challenging. Hepatotoxicity generally presents as asymptomatic elevation of alanine aminotransferase (ALT) or aspartate aminotransferase (AST). Isolated bilirubin elevation is rare, but can occur after prolonged AST and ALT elevation. Hepatotoxicity can occur at any time after treatment but is most commonly seen after 6–12 weeks of the therapy (10). Liver biopsy reveals a pan lobular active hepatitis with a predominant CD8-positive inflammatory infiltrate. This mirrors autoimmune hepatitis and is suggestive of predominant injury to hepatocytes (11). More rarely, predominant injury to bile ducts can be seen with mild portal mononuclear infiltrate around proliferated bile ductules (12). The rate of autoimmune hepatotoxicity varies between different checkpoint inhibitors. The incidence of autoimmune hepatotoxicity, of all grades, with CTLA-4 inhibitors is between 3–9% (10). The rate is lower with PD-1 inhibitors, ranging between 1–3% with grade 3–4 hepatitis being rare (13,14). A recent meta-analysis also supports a higher rate of all- and high-grade hepatotoxicity with CTLA-4 inhibitors compared with PD-1 inhibitors (15). Combining CTLA-4 inhibitors with PD-1 inhibitors substantially increases the risk of hepatotoxicity, with ALT elevation rates approaching 11–20% and grade 3–4 events rising to 11% (7,16,17). A higher rate of elevated transaminases are seen when checkpoint inhibitors are combined with traditional chemotherapy or targeted therapies (18,19).